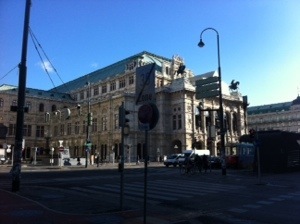 I love Vienna it’s one of my favourite cities mixing old and new really well. I’ve been to Vienna before and really enjoyed it then so I was looking forward to this visit. 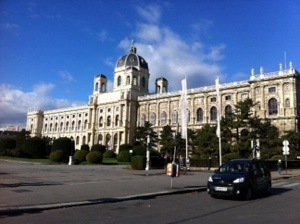 Unfortunately we only stayed one day in Vienna and even though we saw a lot of the city such as the Spanish Riding School, we walked past the Sissy museum, went to the museum quarter and noticed a Gustav Klimt exhibition amongst other things, I would have loved to stay another few days! 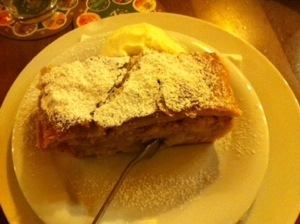 Also try Wiener Schnitzel for dinner and apple strudel for dessert! It is so good it makes my mouth water just thinking about it! The prettiest thing about Vienna to me is how the old buildings and architecture fits right in with all the beautiful new buildings combining the city as a whole. 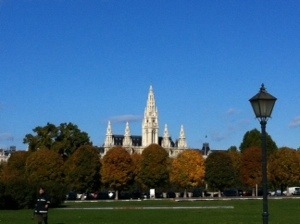 If you like architecture and modern city life be sure to visit Vienna, I’m convinced you’ll love it too!! !